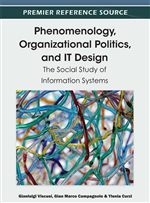 As a result of a steady increase in reach, range, and processing capabilities, information systems no longer appear as independent, but rather as integrated, parts of large scale networks. These networks offer a shared resource for information delivery and exchange to communities, which appropriate them for their respective purposes. Such information infrastructures are complex in several ways. As they are composed of a variety of different components, their openness and heterogeneity make them inherently uncontrollable; through their expansion, these various interconnected networks enter new interdependencies; while they are based on extending existing technical and social networks, they also need to develop and grow over a long period of time; and, they are developed as a distributed activity. Examples of such information infrastructures include the Internet, National Information Infrastructure (NII) initiatives and industry-wide EDI networks, as well as corporate-wide implementations of enterprise systems. The common perspective on the development or evolution of large-scale networks and information infrastructures is network economics. From this perspective, information infrastructures are evolving according to network effects such as increasing returns, positive feedback, network externalities, path dependency, and lock-in (for example Hanseth, 2000). Theories of network economics can be used to explain the evolving nature of information infrastructures, in particular in relation to its users (Hanseth, 2003; Hanseth & Monteiro, 1997; Shapiro & Varian, 1999). Due to heterogeneity and its character of being a network, a successful network evolves by self-reinforcing mechanisms. When a network attracts new users, the value of being part of the network increases (network externalities), and it becomes even more attractive for other users to join the network (Arthur, 1994). When the user base reaches a certain threshold, the network will attract new users for enrolment almost by itself. The growth of faxes, cellular phones, and the Internet has been used to illustrate this pattern of development. However, this base of users may also introduce strong conservative forces, in that large numbers of users make it difficult to change the network, as for example illustrated by the QWERTY keyboard. Introducing a completely new network will not attract users as long as old networks provide sufficient services and have a superior number of users, thus the possibilities of introducing new and competing information infrastructures are limited. Network economics is a macro theory, and describes the development of networks as the sum of individual actions of its users. It does at the same time say little or anything about how developers can involve themselves and influence the network as well as how these networks are interrelated with a wider context. While information systems increasingly develop as ubiquitous, heterogeneous, and pervasive networks, there is a shortage of knowledge and understanding of such development processes (Lyytinen & Yoo, 2002). There is a need to develop and strengthen our theoretical understanding of the process by which information infrastructures are built, and in particular, to open the black box of information infrastructures with respect to their malleability (Orlikowski & Iacono, 2001).